Jarrett Gorin, AICP managed the acquisition of this 28.5 acre property between May and November of 2005 while serving as President of Centerpoint Development Partners (Centerpoint). He then designed and processed discretionary entitlements for a 24-lot subdivision through the Los Angeles County Department of Regional Planning. Centerpoint ceased operations during the review of this project. Its capital investor retained Vanguard Planning to complete the discretionary entitlement process. The Site: The project site (see aerial photo at left) has several features that present major design challenges. The Westernmost portions of the site comprise a gently sloping alluvial terrace. A near-vertical rock outcropping separates the Northernmost 25% of this area from the balance of the moderately sloped terrace. The Easternmost portions of the site are occupied by steep hills. Non-native seasonal grasses are present throughout the moderately sloped areas, which were used as pastures when a dairy operated here in the early 1900’s. The grasslands are surrounded by chaparral and large numbers of Scrub Oaks, a protected tree in Los Angeles County. A drainage channel extends the entire length of the site’s Western boundary. The Northern half of the channel is a riparian corridor thick with Scrub Oaks. The Southern half was re-aligned in the early 1960’s as part of a Vasquez Canyon Road widening project. This section is devoid of any significant riparian vegetation or sensitive biological resources. A broad stretch of land on either side of the channel lies within the 100-year floodplain. The entire site is also located within a designated High Fire Hazard Area. Clustered Development Concept: Existing topographical, flooding, and biological constraints dictated that development should be located within the former pasture areas on the alluvial terrace. Mr. Gorin worked closely with Huitt-Zollars, a national civil engineering firm, to develop a design that clusters lots within these areas. The site-plan achieves nearly the maximum development density allowed on the site while retaining over 18 acres of the property as permanent open space (see exhibit at right). 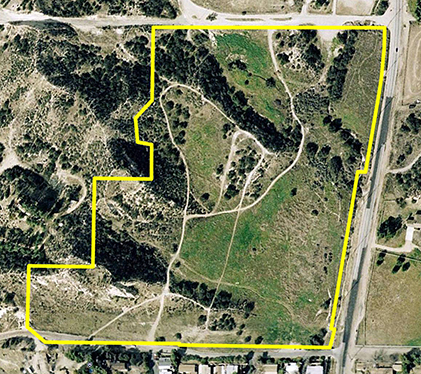 Grading affects only 2.5 acres of open space, leaving 15.5 acres in its existing natural condition. 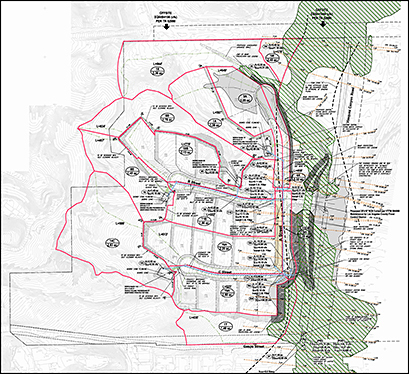 The site-plan avoids placing any portion of a residential lot within the floodplain. Additionally, over one-hundred Scrub Oaks are present onsite, but only four will be removed in association with the project. Placement of development in previously disturbed areas with the flattest topography results in a remarkably low earthwork volume for a project of this scale on a hillside property: 81,418 cubic yards including all cut and fill. Grading is also designed to avoid the creation of any major engineered slopes (see site section below). The average man-made slope height is 7.5 feet. 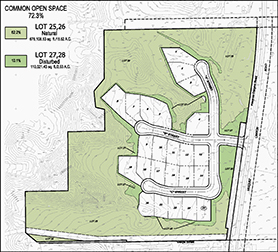 This clustered development concept required approval of a Hillside Management Area Conditional Use Permit, a Vesting Tentative Tract Map, and an Oak Tree Removal Permit. Flooding Issues Associated with Revised Access: In 2005, when the property was acquired, the owners of an approved 63-lot tract to the Northeast were rapidly moving forward to construct their project. That project was sold to a new developer in 2007, at which time all progress stopped. Access for the Vasquez Canyon subdivision was originally designed to come from Meadstone Road, adjacent to its Northern boundary. A project entrance intersecting this road would not require a new crossing over the onsite drainage channel. Meadstone Road would have been improved to public street standards prior to initiation of physical improvemnts for Centerpoint’s project if development of the adjacent subdivision had proceeded on schedule. In early 2008 it became clear that the adjacent developers would likely file for bankruptcy. Centerpoint’s proposed subdivision could no longer take advantage of road improvements constructed to serve the neighboring subdivision. The project was revised to take access directly from Vasquez Canyon Road. Mr. Gorin identified an optimum location that maintains the greatest possible spacing between the project entrance and existing intersections to the North and South, and places the new crossing where it will not impact riparian habitat in the Northern portion of the drainage channel. The revised design will also restore the Southern half of the channel to a more natural condition. Significant impacts to biological resources and traffic circulation were avoided; however, the new crossing generated the potential for flooding impacts to neighboring properties. The revised project realigned the channel further to the East, and placed an obstruction in the path of the water flow across the project site. 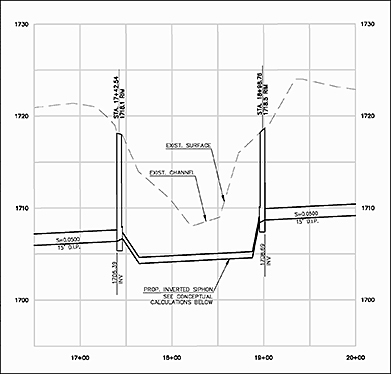 To obtain approval for the revised design from Los Angeles County Department of Public Works, and to avoid the need for an Environmental Impact Report, the crossing and revised channel alignment were designed so that future flood surface elevation limits would not exceed the existing limits. Huitt-Zollars completed a HEC-RAS analysis of the new access concept as part of the design process. These studies analyze how a proposed channel configuration will impact drainage flows. Three dimensional models of existing and revised topography, and the water volume for a specific flood event (i.e. the 50-year flood), are used to predict future flood surface limits (shown in green on the drainage map above). The HEC-RAS analysis demonstrated that the project would not generate flooding impacts to adjacent properties. Concurrent Processing of Gated and Non-Gated Designs: The direct-access concept also presented an opportunity for a gated entry. These are often considered desireable; however, they can increase construction and operational costs. Centerpoint understood the value of providing a gated entry option, but without an identified buyer for the subdivision, the company did not want to commit to a gated entrance. Mr. Gorin persuaded County staff to review gated and non-gated versions of the subdivision concurrently, making it possible for a single set of discretionary approvals to apply to both configurations. A future developer could then choose whether to install an entry gate without any need to obtain a revised project approval. Offsite Sewer Extension Issues:The adjacent devloper’s bankruptcy generated other major issues for this project. It was originally designed with the expectation that sewer and water lines serving the neighboring tract would be in place along two of the subject property boundaries. With the adjacent project delayed indefinitely, it became necessary to engineer offsite utility extensions, including a 2,400 linear foot sewer line. The new sewer had to be sized to accomodate effluent from future upstream development as well as the subject property. It also had to cross Mint Canyon Creek, a major regional drainage course. Crossings are typically accomplished by “hanging” the sewer line beneath existing infrastructure, such as a road bridge. In this case, a bridge was present at the right location, but the underside was too high. A gravity-flow crossing beneath the creek was not an option because it would result in a downstream pipe elevation over 20 feet deeper than the existing sewer line with which the extension had to connect. A mechanical lift station was not feasible due to prohibitive cost, and lack of a suitable location. Mr. Gorin eventually identified an option known as an “inverted siphon” (see engineering detail above right), which has been used successfully in cases where sewer trunk lines must pass beneath major obstacles such as multi-lane freeways. An inverted siphon could be used to cross beneath Mint Canyon Creek at an adequate depth, and could provide a high enough outflow elevation to enable gravity-flow to the required connection point. This solution is also non-mechanical and can operate during power failures. Huitt-Zollars confirmed that an inverted siphon is feasible, and Mr. Gorin persuaded Public Works staff to allow its use. With all of the major design challenges finally resolved, the subdivision was scheduled for review by the Los Angeles County Regional Planning Commission. Vanguard Planning presented the project on behalf of the applicant at the March 31, 2010 hearing, and obtained a unanimous approval.